Darna is a fictional superhero created for Pilipino Komiks by writer Mars Ravelo and artist Nestor Redondo in 1950. She first appeared in Pilipino Komiks (Ace Publications, Inc.) #77 (May 13, 1950). 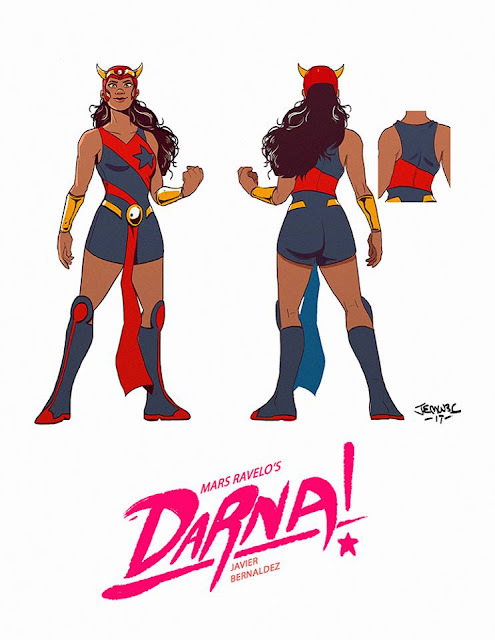 Darna is an update of Ravelo's earlier character, Varga, whose stories he wrote and illustrated himself. This character first appeared in Bulaklak Magazine, Volume 4, #17 (July 23, 1947). However, Ravelo left Bulaklak due to differences with the publication's editors. One of the most popular Filipino superheroes, Darna has appeared in many films and several tv series through the decades which have far overshadowed her actual comics tenure. Her origin begins with her being an extraterrestrial, which she can magically manifest herself through a human named Narda and by swallowing the magical white stone, prompting by shouting, "Darna!". She is often accompanied by her younger brother, Ding. Her costume comprises of a red two-piece bikini with 2 large gold stars on each brassiere cap. She also wears a red helmet with golden wings in front adorned with a ruby in the middle. The bikini also clads with a white cloth held by a golden medallion belt with almost knee-high red stiletto boots. The character has been adapted extensively and portrayed in other forms of media as well, including films and television series. Several actresses have portrayed Darna in motion pictures and TV series including Rosa del Rosario, Liza Moreno, Eva Montes, Gina Pareño, Vilma Santos, Lorna Tolentino, Rio Locsin, Sharon Cuneta, Nanette Medved, Anjanette Abayari, Regine Velasquez, Angel Locsin, and Marian Rivera. Liza Soberano will portray the newest incarnation of Darna in an upcoming film adaptation of Star Cinema. 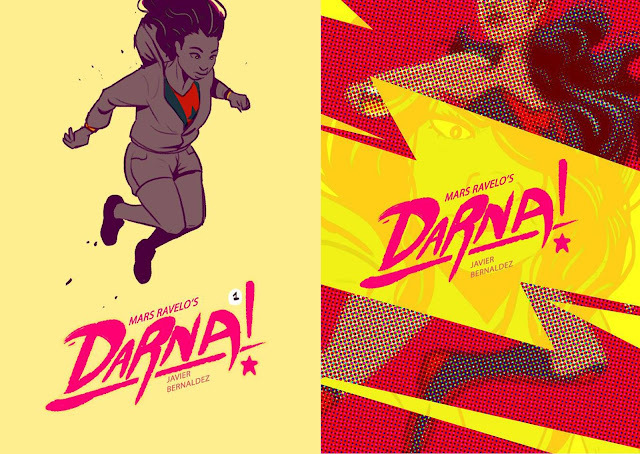 Just recently, a new Darna project took Facebook by storm. It was from Jemuel Bernaldez's (Jem) Facebook page. 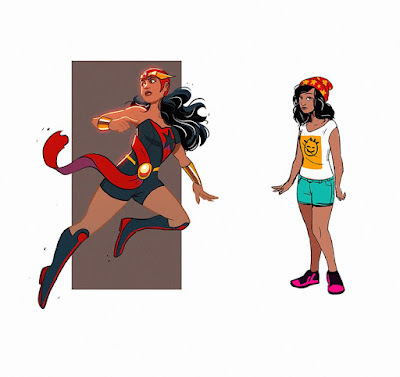 The post shows a familiar Darna but different in looks and art style. Jem is a graduate of BFA Advertising at the University of Sto. Tomas, to which he quips, "haven't made use of my degree since". He's an illustrator and a 3D Mobile Lead of The Studio of Secret 6, Inc. by day and sometimes a comic artist by night. With the increasing popularity of the re-imagined Darna, a new hashtag was born: #SigawDarna. 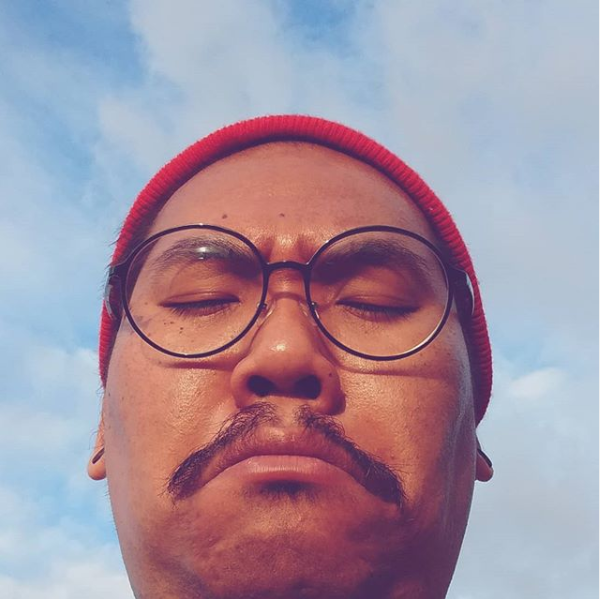 Can you describe the "Darna" project you posted? It started around 2016 when I was contacted by Carl Joe Javier formerly from Anino Publishing to jump into this project with Adam David. 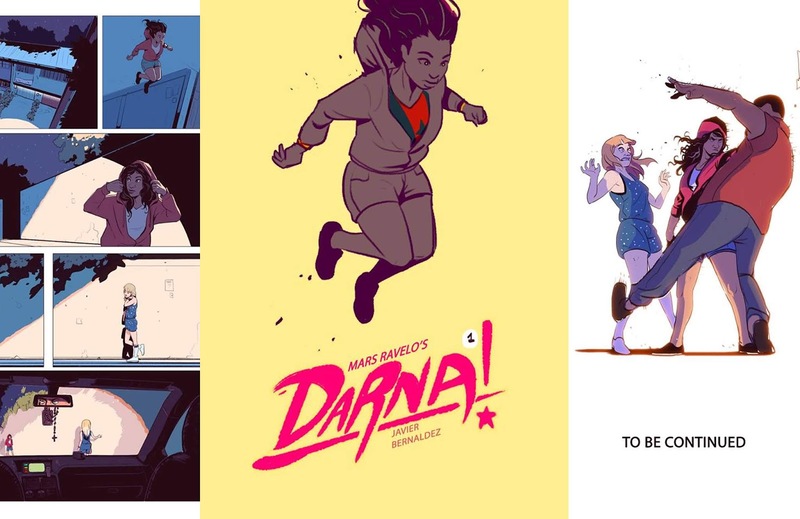 We are to create comics that will be released alongside the upcoming Darna movie. 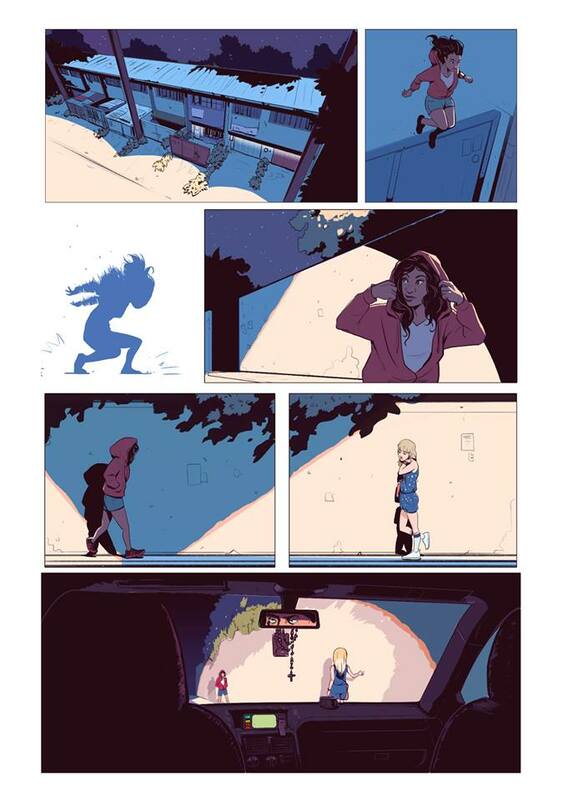 A page from Jem's Darna project. Apart from yourself, are you with someone during the process of the project? Aside from Carl Joe and Adam, we are a group who collaborates with different artists and writers to conceptualize their own spin on our local superheroes (Captain Barbell, Lastikman, etc) with notable personalities like Noel Pascual (Patay Kung Patay) and Jo Nicholas (Windmills) just to name a few. Everyone is praising how fresh your concept of Darna is. How did you come up with that? Simply gathering inspiration from Marvel's own, Ms. Marvel and Ms. America and how progressive their storylines were when they were first introduced. 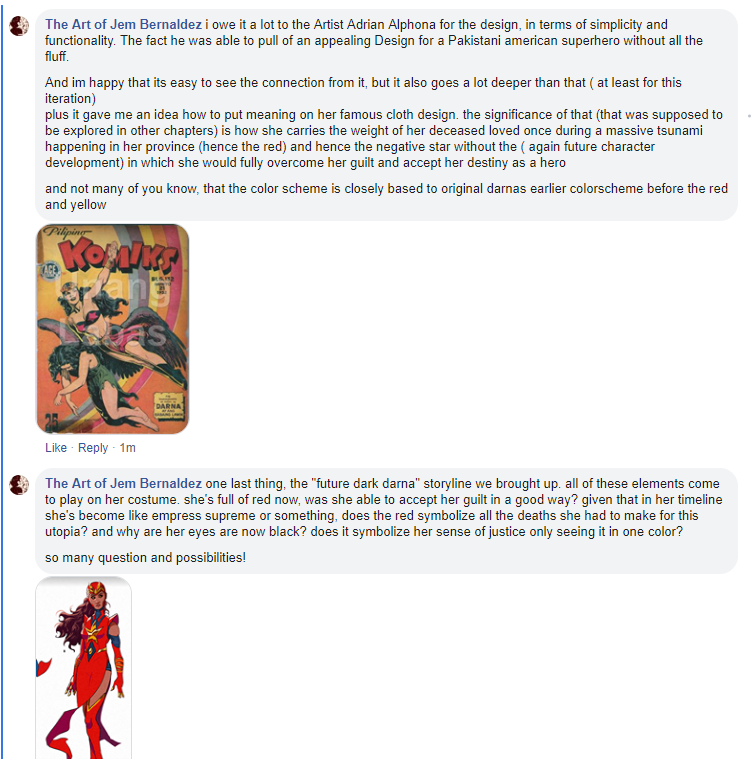 I also did some heavy research on Darna herself. What did she really symbolizes? Were those ideals outdated? What made it appealing during their time? Would it be a good idea to reintroduce her radically but with the familiar theme in mind? I really didn't want her to be remembered by her bikini outfit and catchphrases. Sure it's iconic, but you have to admit it did lose any meaning that made her appealing in the first place. And most importantly, can I make the costume better in terms of function vs aesthetic? And to be honest, with the time frame given to get the pitch going, I couldn't answer everything in one go so it's not really like a real solid solution for her character. But I was happy enough to get to reintroduce her the way she is now and made a lot of people excited and it. We had a fair share of different Nardas in the past as we've seen in the movies and TV: tall, skinny, fair complexion (sometimes brown thanks to Anjanette Abayari and Angel Locsin), and curly long hair Darnas. Any particular person as inspiration you have in mind for Narda? Nothing that I could think of really. I'm really not familiar with a lot of local celebrities so you will have to forgive me for that. Haha! But if I had to choose, it would be Angel Aquino for Dark Darna. Who are your art heroes, both local and international? There's a lot to chose from. For international: Chris Samnee, Kris Anka (basically the guy who makes really good character redesign costumes), and Kohei Horikoshi ( Boku no Hero Academia). For local: Abigail Dela Cruz (@hyamei), Cy Vendivil (@cyanroll), and Tristan Yuvienco (@trisketched). Just to name a few. I swear there are so much amazing people with skills that I just wish I could just absorb! Upon posting, local comic book celebrities noticed your work such as Rian Gonzalez (Marvel cover artist) and Arnold Arre (The Mythical Class) among others, how do you feel about it especially they seem to love your work? I'm actually friends and collegemate with Rian Gonzales! As Arnold Arre, I met him once but I do admire a large body of his work! His short Darna comics, DARNA LIVES, with Gerry Alanguilan was also one of my main inspirations for my Darna. How do you feel when the project was rejected? I would say I wasn't that surprised especially when the higher-ups were, during that time, started giving us a tighter leash--- which is to be expected since they have to check with consistencies with the brand from time to time. But the disappointment was still there, the comics scene was still being underestimated on how they want their stories to be: something new, something risky, something different. We wanted to deliver that at least for them, but they said no. The image on the left is Jem's concept for the teaser image if ever this project got greenlit featuring minimalist design whereas on the right is what the client's vision of a "loud" cover. Do you have plans continuing it? Not really. We believed in our original vision. If we can't have that executed the way we wanted, I wouldn't be interested. But nothing is certain after the post came up and all the good reception we're getting, I think it will be up to us to move on and keep on creating. Are there any future projects from you? Not really anything comics-wise, but from my day job we are proud to showcase Project Xandata. Project Xandata is a skill-based competitive, first-person shooter by veteran Filipino developers, Secret 6. 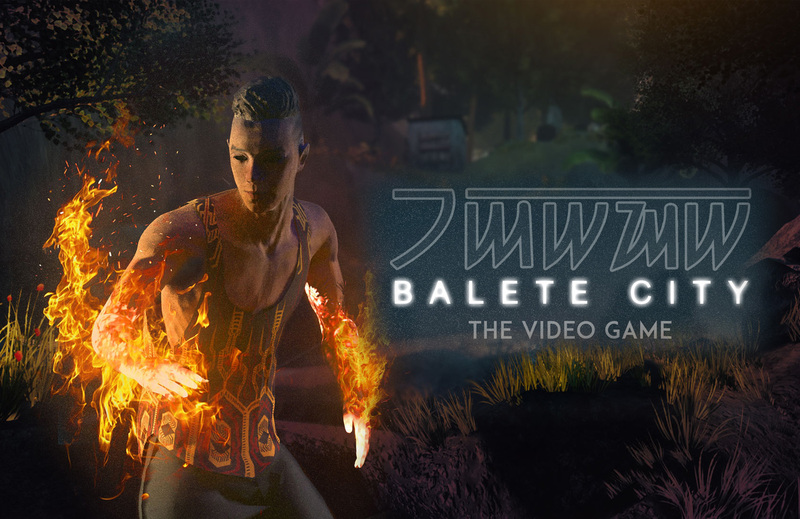 Engage in your chosen playstyle with an expansive customization system in a world that blends sci-fi, fantasy, and Philippine mythology. You may follow further development of Project Xandata on our FB page. Any shoutout to anyone who experiences rejection? Don't stop creating. Pick yourself up, improve, reiterate, move forward, don't stop creating. Be kind to yourself in between those, we may all want to work harder after every rejection but also remember to work smarter. You may not be the next big hit from clients, but you are always the biggest thing to the people who support you. Follow Jem on Twitter: @yosilog and on his FB page at The Art of Jem Bernaldez for updates on his Darna project and new artworks as well.